I have always loved puppets, I love the illusion of their lives, I love their freedom and the way both audience and performer creates their reality. So I went to see Dunham’s show in Muncie this past weekend, not knowing any of his material, not having seen him for years. It was a truly cross-cultural experience. If I had seen him on TV it would have been different. I could have taken his jokes with a grain of salt, passed them off as “mere entertainment” and laughed at the conceit of puppets, often associated with children, cussing to adults. But this show was to a packed and lively theater of 3500 people, a majority of whom were true fans, people who had memorized numerous lines of the skits and who knew his characters as if they were friends. There was a second show at ten that night that was almost as full. Perhaps I am just getting old; it was a ‘college’ audience, comprised heavily of people half my age. Perhaps that caused the jokes to go under (rather than over) my head. In that context I felt wary, out of place, as if I had stepped into the middle of something but I did not know what it was, and thus felt a little wary and skeptical. I almost never laughed. I kept a short list of things I liked, (my favorite moment was when old Walter reminded Dunham that the puppeteer was aging but the puppet was not until one day Jeff would catch up with Walter and they would become ‘the Sunshine Boys.’) The list of things I did not like was long. I tried to remember what sort of jokes I would have laughed at when I was twenty. Somehow, my youthful memorizing of Monty Python lines seemed different than this. For me there was far too little of what I would call ‘intellectual’ content. There were too many small-minded stereotypes and too many jokes about penises and tampons. Achmed the terrorist, (who clearly says he is not a Muslim and thus emphasizes the link,) panders to stereotypes and fears of Middle Eastern terrorists. I did not relate to the hyperactive “Peanut” puppet at all. The term “Political Correctness” was used by the show in its original sense of ‘stupid liberal ideas about offending people.’ Gender inclusive language was a forgotten myth. It was disturbing but good to see the crazy small-mindedness of humanity in full display. Now I work for the larger mind which I hope will dominate our voting this coming Tuesday. I liked when he said, “I believe in ‘I don’t know. '” That reminded me of my sermon on Paul Rasor’s “Faith Without Certainty.” However, after Bill’s final lecture (mini-sermon,) with the penultimate image of a nuclear explosion echoing in my mind, I turned to my friend and said “That was depressing.” The basic idea that human stupidity and our hunger for certainty, coupled with Jewish, Muslim and Christian orthodoxy, will all inevitably come to violence which will destroy us all, is a pretty sad one. A Realistic but depressing view, and faithless. My favorite segment was when he was talking to the radically liberal priest in Saint Peter’s Square. I get a big smile thinking of this happy man saying the obvious and laughing: that the huge edifice of the Vatican was incongruous with the life and teachings of Jesus, that Hell was a ridiculous idea, that most of the superstition and foolishness that Bill had been taught as a child was simply superstition and foolishness. Then Bill asked him what could be done about all these people with crazy ideas and the priest laughingly said “nothing.” What I heard was that we need to accept that somethings will not go away, chief of those being human stupidity. Rather than try to fight or inform every poor soul on the earth, we need to simply be as loud and proud about what we are as the stupid and violent are about themselves. We who understand the ultimate vitality of doubt do need to organize and claim power from the violent and build a better world. We also need a lot more compassion, justice and equity in human relations, and to affirm the web of existence. I think that someone, not Larry Charles, could have used Bill Maher to say that much more effectively, and without all that grainy stock footage of cheesy religious films. I have been having fun creating “beautiful word clouds” with Wordle [at wordle.net]. There one can put in text, any text, sermons, poems, lists… Then the program makes art out of them. It chooses the fifty most used words and arranges them. You can adjust the arrangement a little, the font and color, etc. I like putting in the text of my sermons and getting art, little visual pictures of the sermons. 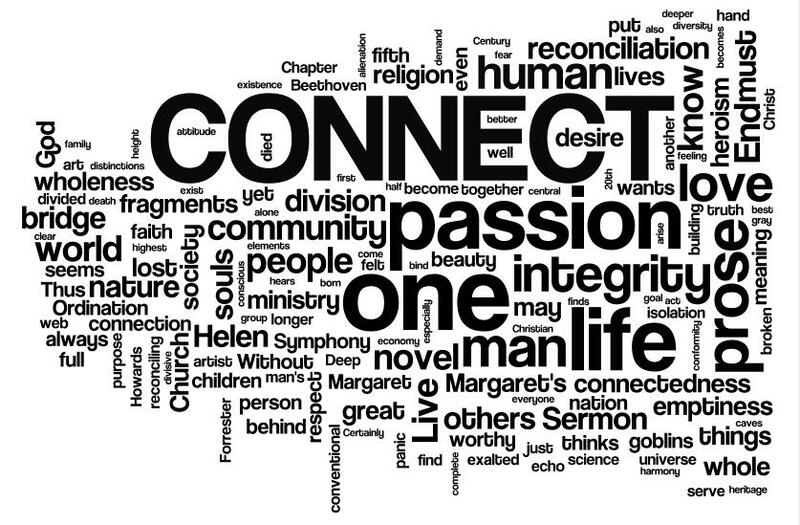 I think the best ones have one or two central words that stand out and anchor the wordle. Sometimes the program makes unintentional messages, putting two words like “divisive” and “church” or “know, another, feeling” next to one another. It is great. Lots of fun for word nerds like myself.